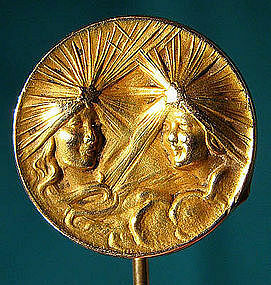 A vintage and superb Art Nouveau period 9/16" diameter 12K yellow gold stickpin (unmarked but tested) c1890-1900. This 2-1/2" stickpin features two Art Nouveau maidens with flowing decoration and bright beams of light flashing from a star in their hair. It has a typical period matte or Roman finish of deep yellow old (the gold was acid treated to bring a pure gold bloom or colour to the piece, apopular finish at the time). It weighs 2.0 grams and it is in very good original condition with no bends, corrosion, losses, damage or repairs other than a small dent on the rim at the back of the pin. All items are thoroughly and conservatively graded and all condition issues are noted; all items are secondhand and may have slight signs of gentle use. Surface shipping to the continental U.S. starts at $6 (other spots may vary) - insured is higher, and mandatory on items over $85 if paid with a credit card. Items paid with a credit card will be shipped to confirmed addresses only. We do ship internationally. All of our prices are in $US. NOTE: we do not accept PayPal. A beautiful sterling silver and purple crystal sautoir necklace circa 1920s. 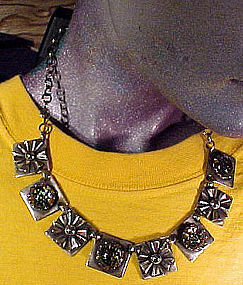 This ekegant early Art Deco era necklace has a large amethyst crystal facetted unfoiled stone and paste rhinestones. The drop measures 2" x 3/4", the fine link chain is 17-1/2" long and it is stamped STG with a maker's mark. It weighs 7.2 grams and it is in excellent original condition with no chips, cracks, dents, bends, corrosion, losses, damage or repairs. All items are thoroughly and conservatively graded and all condition issues are noted; all items are secondhand and may have slight signs of gentle use. Expedited tracked insured post to the U.S. starts at $21 (other spots may vary) - insurance and tracking included in shipping quotes. Items paid with a credit card will be shipped to confirmed addresses only. We do ship internationally. All of our prices are in $US. PLEASE NOTE: we do not accept PayPal. A mid-Victorian pink coral & jet cameo brooch circa 1860s. This period 1-1/2" x 1-1/4" natural jet and pink coral portrait cameo pin is unsigned and it features a pale pink coral cameo set in jet, mounted on a brass back with a c-clasp. 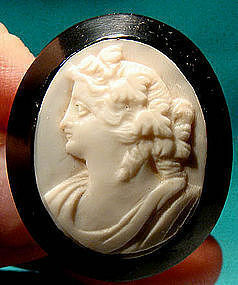 This item is in very good original condition with no cracks, dents, bends, corrosion, losses, damage or repairs other than some roughness and (possibly original) edge chipping to the jet around the inset cameo. All items are thoroughly and conservatively graded and all condition issues are noted; all items are secondhand and may have slight signs of gentle use. Expedited packet air post to the U.S. starts at $19 (other spots may vary) - insurance and tracking includeds. Items paid with a credit card will be sent to onfirmed addresses only. All of our prices are in $US. PLEASE NOTE: WE DO NOT accept PayPal, only VISA and MASTERCARD. 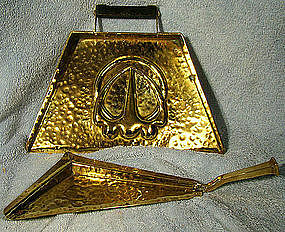 An Edwardian Arts and Crafts hammered brass crumber and tray. This hand made brass crumb scoop and tray dates to the 1900-10 Edwardian era. This high quality hammered serving set is in the Newlyn school style and it features rivet construction, a screw-mounted black-painted wooden handle and cast handles and mounts. It is unsigned, and the crumber measures 11-1/2" long with the pan measuring 9-3/4 x 7-3/8". It is in excellent original condition with no dents, bends, corrosion, losses, damage or repairs other than some residual patina which can be further polished out if desired and some slight rubs to the handle's paint. All items are thoroughly and conservatively graded and all condition issues are noted; all items are vintage or antique and may have slight signs of gentle use. Expedited tracked and insured parcel shipping to the U.S. starts at $20 (other spots may vary, air is higher). Items paid with a credit card will be shipped to confirmed addresses only. We do ship internationally. All of our prices are in $US. PLEASE NOTE: We DO NOT accept PayPal. An Edwardian 14K seed pearl brooch pin with leaves and flowers with seed pearls circa 1900 1910. This antique 1-7/8 x 1/2" has the original c-clasp and it weighs 1.9 grams. It is marked 14K, and it is in excellent original condition with no chips, cracks, dents, bends, corrosion, losses, damage or repairs. All items are thoroughly and conservatively graded and all condition issues are noted; all items are vintage or antique and may have slight signs of gentle use. Expedited tracked and insured parcel shipping to the U.S. starts at $19 (other spots may vary, air is higher). Items paid with a credit card will be shipped to confirmed addresses only. We do ship internationally. All of our prices are in $US. PLEASE NOTE: We DO NOT accept PayPal. 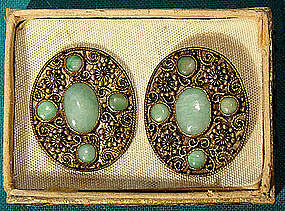 A pair of German Art Deco rhinestone dress clips circa 1920s. These vintage 1-7/8" x 3/4" clips are signed DRGM 58525, which is used on German items under patent design. The tension on the snaps is firm and tight, and they are in excellent original condition with no chips, cracks, dents, bends, corrosion, losses, damage or repairs other than some minor darkening to a couple of the stones. All condition issues are noted; all items are vintage or antique and likely have signs of use or patina, as should be expected. Tracked parcel to the US is $14 (other spots may vary). Insurance/tracking included. Items paid with a credit card will be sent to confirmed addresses only. All of our prices are in $US. PLEASE NOTE: we do not accept PayPal. A colourful c1950s-60s Native North American Indian Six Nations 32" beaded necklace (Canadian). This necklace features a central 2-3/8" hand-sewn felt backing, and it is in excellent original condition with no chips, cracks, losses, damage or repairs. All items are thoroughly and conservatively graded and all condition issues are noted; all items are secondhand and may have slight signs of gentle use. Surface shipping to the continental U.S. starts at $6 (other spots may vary) - insured is higher, and mandatory on items over $85 if paid with a credit card. Items paid with a credit card will be shipped to confirmed addresses only. We do ship internationally. All of our prices are in $US. NOTE: we do not accept PayPal. 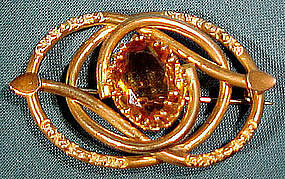 A stylish Victorian gold filled 2-1/8 x 1-3/8" pin with a central claw-set facetted amber crystal stone. This unsigned pin has the original c-clasp, and it is in excellent original condition with no chips, cracks, dents, bends, corrosion, losses, damage or repairs. All items are thoroughly and conservatively graded and all condition issues are noted; all items are secondhand and may have slight signs of gentle use. Surface shipping to the continental U.S. starts at $6 (other spots may vary) - insured is higher, and mandatory on items over $85 if paid with a credit card. Items paid with a credit card will be shipped to confirmed addresses only. We do ship internationally. All of our prices are in $US. NOTE: we do not accept PayPal. A cool vintage 1930s silver plated 17-3/4" long necklace featuring glass domes with foiled backs resembling black opals, alternating with links with metal flowers. Each link is 3/4" across, and this unsigned necklace has a hook clasp. This item is in excellent original condition with no chips, cracks, dents, bends, corrosion, losses, damage or repairs. All items are thoroughly and conservatively graded and all condition issues are noted; all items are vintage and may have slight signs of gentle use. Small packet surface shipping to the U.S. starts at $6.80 (other spots may vary) - insurance is included. Items paid with a credit card will be shipped to confirmed addresses only. We do ship internationally. All of our prices are in $US. PLEASE NOTE: We DO NOT ACCEPT PayPal, only VISA and MASTERCARD. 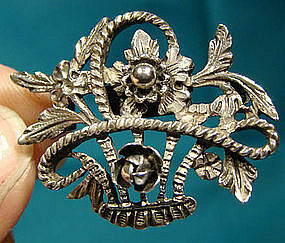 A well-made sterling silver 1-1/2 x 1-1/8" pin in the form of a basket of flowers. Signed by Fm (Famille) PERUZZI of Florence, Italy, this pin has a safety catch and it weighs 7.0 grams. This item is in excellent original condition with no dents, bends, corrosion, losses, damage or repairs. All items are thoroughly and conservatively graded and all condition issues are noted; all items are secondhand and may have slight signs of gentle use. Surface shipping to the continental U.S. starts at $6 (other spots may vary) - insured is higher, and mandatory on items over $85 if paid with a credit card. Items paid with a credit card will be shipped to confirmed addresses only. We do ship internationally. All of our prices are in $US. NOTE: we do not accept PayPal. A great looking vintage retro period gold-washed sterling silver necklace signed by Coro c1940s. 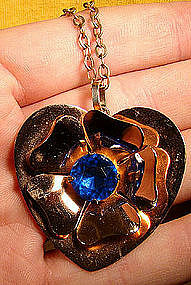 This necklace consists of the 1-3/4" across heart-shaped pendant with a raised centre flower, with blue claw-set prystal or clear blue lucite facetted "stone" and the matching 16-1/8" link chain with loop and tab catch. Each component is washed in rose gold, and the pendant is signed CORO STERLINGCRAFT with STERLING on the chain. It weighs 18.5 grams, and it is in excellent original condition with no chips, cracks, gilt wear, dents, bends, corrosion, losses, damage or repairs. All items are thoroughly and conservatively graded and all condition issues are noted; all items are secondhand and may have slight signs of gentle use. Small packet surface shipping to the U.S. starts at $6.80 (other spots may vary, air post slightly higher) - insurance included to $100. Items paid with a credit card will be shipped to confirmed addresses only. We do ship internationally. All of our prices are in $US. PLEASE NOTE: we DO NOT accept PayPal, only VISA and MASTERCARD. 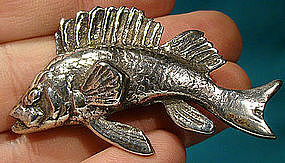 A heavily cast vintage 1920s brooch in the shape of a fish. This 2-1/2 x 1-1/2" pin weighs an impressive 22.g grams, it has a c-clasp, it is stamped SILVER, and it is in excellent original condition with nodents, bends, corrosion, losses, damage or repairs. All items are thoroughly and conservatively graded and all condition issues are noted; all items are secondhand and may have slight signs of gentle use. Surface shipping to the continental U.S. starts at $6 (other spots may vary) - insured is higher, and mandatory on items over $85 if paid with a credit card. Items paid with a credit card will be shipped to confirmed addresses only. We do ship internationally. All of our prices are in $US. NOTE: we do not accept PayPal. 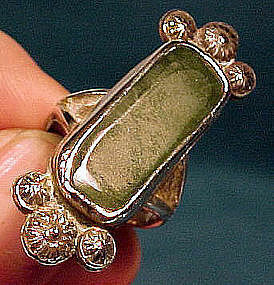 A Navajo sterling silver and nephrite jade ring circa 1960s. This vintage hand made statement size 6 ring is unsigned, which is not unusual in older pieces. It was brought here from Arizona approximately 50 years ago. It measures 1-3/4" x 5/8" across the top section, and weighs 10.2 grams. There are 3 star-like symbols at each end, which may represent the tribal hogan, or home. It is in excellent original condition with no chips, cracks, dents, bends, corrosion, losses, damage or repairs. The stone is hand cut and polished, so a little unsophisticated by modern tribal artisan standards but an interesting piece. All condition issues are noted; all items are vintage/antique and will have signs of use and patina. as should be expected. Tracked packet post to the US starts at $14 (other spots may vary) insurance is included. Items paid with a credit card will be sent to confirmed addresses only. All of our prices are in $US. NOTE: we do not accept PayPal. 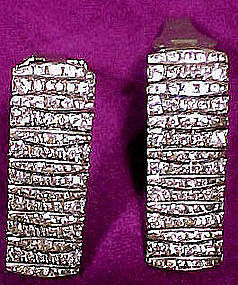 A fine pair of signed Mexican sterling silver screw-back earrings by Los Ballesteros c1950s. These 1" x 5/8" earrings are stamped HECHO EN MEXICO 925 plus the Ballesteros mark, they weigh 9.2 grams, and they are in excellent original condition with no dents, bends, corrosion, losses, damage or repairs. All items are thoroughly and conservatively graded and all condition issues are noted; all items are secondhand and may have slight signs of gentle use. Small packet air shipping to the U.S. starts at $9.50 (other spots may vary, tracked is higher). Items paid with a credit card will be shipped to confirmed addresses only. We do ship internationally. All of our prices are in $US. PLEASE NOTE: we DO NOT accept PayPal, only VISA and MASTERCARD. An ornate Barker Ellis sp footed mustard pot with spooon. 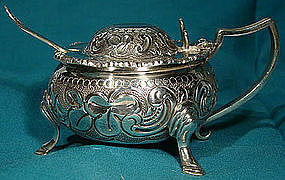 This high quality vintage silver plated footed mustard pot with spoon is by the English firm Barker ELLIS (also known as Ellis Barker or Barker Ellis). This hard-to-find mustard pot measures 2-7/8" diameter (excluding handle), it has gorgeous repousse work with clover leaves and it includes an unmarked 3-5/8" silver plate shell pattern mustard spoon. It has the Barker Ellis candleabrum mark, and this lovely serving piece is in very good original condition with no dents, bends, losses, damage or repairs other than some typical pitting on the interior. All items are thoroughly and conservatively graded and all condition issues are noted; all items are vintage or antique and may have slight signs of gentle use. Tracked Packet shipping to anywhere in the U.S. is $15.00 - this includes online tracking, air service and insurance up to $70. Items paid with a credit card will be shipped to confirmed addresses only. We do ship internationally. All of our prices are in $US. PLEASE NOTE: We DO NOT accept PayPal. 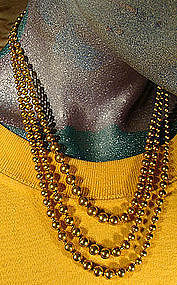 A vintage 1930s triple strand graduated gold plated brass ball necklace. This 16" necklace has balls ranging from 1/8" to 1/4" and it has a fancy box clasp; it is unsigned and it is in excellent original condition with no dents, bends, corrosion, losses, damage or repairs. All items are thoroughly and conservatively graded and all condition issues are noted; all items are secondhand and may have slight signs of gentle use. Surface shipping to the continental U.S. starts at $6 (other spots may vary) - insured is higher, and mandatory on items over $85 if paid with a credit card. Items paid with a credit card will be shipped to confirmed addresses only. We do ship internationally. All of our prices are in $US. NOTE: we do not accept PayPal. 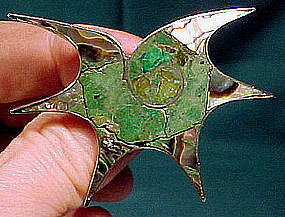 An impressionistic Mexican sterling silver 2-5/8" x 2-1/4" starfish pin c1950s by Beto. This attractive vintage pin features abalone with inlaid malachite/turquoise; it is stamped STERLING HECHO EN MEXICO 925 TAXCO GBC and BETO, and it weighs 9.9 grams. This item is in very good vintage condition with no dents, bends, corrosion, or losses, but there does appear to be a bit of cracking from dryness around the malachite stone on the centre of the brooch. All items are thoroughly and conservatively graded and all condition issues are noted; all items are secondhand and may have slight signs of gentle use. Small packet surface shipping to the U.S. starts at $6.95 (other spots may vary, air is higher) - insurance is included in shipping quotes. Items paid with a credit card will be shipped to confirmed addresses only. We do ship internationally. All of our prices are in $US. PLEASE NOTE: we DO NOT accept PayPal, only VISA and MASTERCARD.